The vast state of Texas is home to lots of different things, and that includes a couple species of snapping turtles, both of the family Chelydridae. These two species are alligator snapping turtles (Macrochelys temminckii) and common snapping turtles (Chelydra serpentina). Both of these varieties reside exclusively in North America and possess uber-sturdy jaws. Habitat-wise, alligator snapping turtles are freshwater residents. They tend to gravitate to wetlands, sloughs, lakes, bayous and sizable rivers. The youngsters, on the other hand, usually are found in tinier creeks. They are drawn to deep rather than shallow H20. Common snapping turtles opt for freshwater environments, or for water that is just a tad salty, with some seawater blended in. They are especially common in sluggish water that is full of plants. They often are seen living in rivers, lakes and wetlands. Fellow turtles make up a big portion of the alligator snapping turtle diet. They also dine on snakes, salamanders, frogs, fish, birds, bugs, crayfish, mussels, clams and even fruit and roots of plants. Mammals sometimes even make appearances in their feeding plans. Common snapping turtles also have diverse diets, with some favorites including shrimp, fish, crabs, leeches, sponges, spiders, toads, frogs, worms, tiny mammals, carrion and water plants. Like alligator snapping turtles, they also occasionally consume tinier turtles. If they're physically capable, they're probably going to chow down on it -- they're not choosy eaters. Alligator snapping turtles also lives in areas outside of Texas. They are particularly prevalent in southern regions of the United States -- think Georgia. However, they also have a presence in the Midwest, specifically Kansas and Illinois. Common snapping turtles have a broad geographic scope that goes far beyond Texas. Not only are these reptiles common in many states, they also reside in parts of Canada, including Nova Scotia, Quebec and New Brunswick. 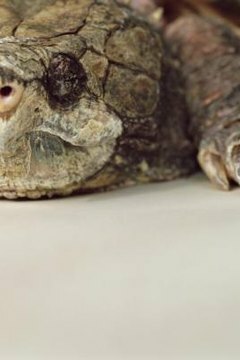 Mature alligator snapping turtles don't have many worries as far as predators are concerned, with the exception of human beings. Raccoons sometimes prey on the youngsters. Sizable birds and fish also frequently go after juveniles of the species. Adult common snapping turtles also don't have many predators, apart from people. Predators are a big concern for young specimens, however. Some prominent predators of young common snapping turtles are foxes, skunks, raccoons, snakes and crows. Alligator snapping turtles' prickly shells generally grow to anywhere between 31 and 40 inches. They usually weigh somewhere between 154 and 176 pounds and are noted as being the biggest freshwater turtles. Common snapping turtles are markedly smaller. Their shells are usually anywhere from 8 to 18 inches in length. They also usually weigh somewhere between 8 and 35 pounds -- positively tiny in comparison. What Type of Water Do Red-Eared Sliders Live in?